The old house at 22 Court St. sits just behind the historic jail and former sheriff’s residence located at 20 W. Central Ave., Delaware. On Thursday, commissioners approved adding the house to the invitation to bid on the historic jail as an alternative. The Delaware County historic jail and former sheriff’s residence currently houses the county law library. 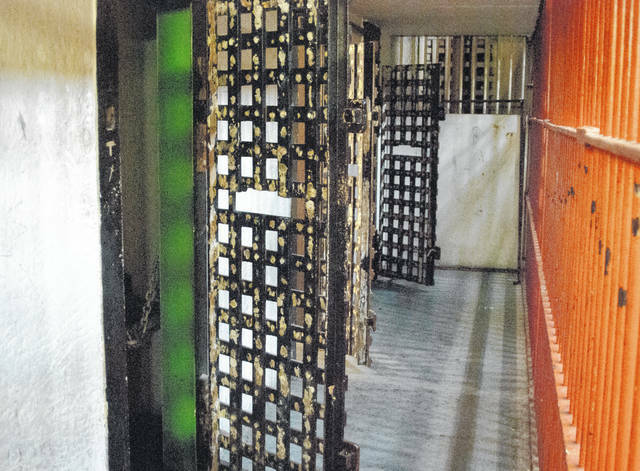 However, by walking through the entrance of the library and heading straight back, the old jail cells can be seen behind a large steel door. There are two rows of cells, four cells each, all wide open with chewing gum displayed on the inside of the doors. The Delaware County Board of Commissioners approved an addendum to the invitation to bid on the county’s historic jail and former sheriff’s residence that gives bidders a choice in bidding. According to the commissioners’ journal, bids may now be placed on the base bid, the 1878 jail and former sheriff’s residence on an approximately 0.45-acre lot, which includes approximately 19 parking spaces located west and north of the building located at 20 W. Central Ave., Delaware. 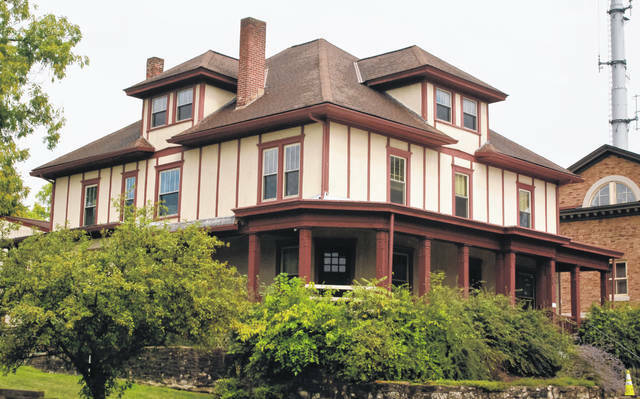 As another option, bids may be placed on the property as bid alternate number one, which includes the base bid (historic jail and sheriff’s residence), along with the house located behind the jail at 22 Court St. and the parking lot west of it. “Bidders can bid on the one or both,” said Jon Melvin, director of facilities. Commissioners originally approved posting the invitation for bids on the jail and sheriff’s residence in February, but in May, they rejected all bids in order to revise the bidding criteria. In their July 19 meeting, commissioners approved posting the revised invitation to bid with a bid opening date of Aug. 24. The newest round of bids is scheduled to be open Oct. 31. Again, as in the other invitations, “commissioners can accept or reject the bids for the one or both,” Melvin said. According to the commissioners’ journal, the board established a minimum bid of $100,000 for the jail and sheriff’s residence, the base bid, and a minimum bid of $175,000 to bid on alternate number one, the jail property and the house behind it. Both bidding options will be sold to the highest responsible bidder. • Bidders are aware that the property is listed as a historical building and landmark. • Bidders are to include a summary of the plans for use of the property, proposed renovation, rehabilitation or remodeling. • Bidders that propose renovation and rehabilitation will be given preference. • Bidders shall include at least three references of experience or ability to own, renovate, rehabilitate, or remodel historical structures. • Bidders shall include the names of all consultants or contractors retained for evaluating, renovating, rehabilitating or remodeling the property. • Bidders shall submit a business plan and economic impact statement, financial ability to complete and maintain improvements to the property, the number of jobs that will be created, and the tax revenue to be generated. • Bidders shall comply with all requirements of the standards for rehabilitation and Delaware City Codes for historic district overlay as currently enacted. • In the event of non-compliance with the stated requirements or if the Delaware City Historical Preservation Commission determines that the property is in imminent risk of deterioration and is not remedied within 90 days or upon the filing of an application for a permit of demolition of the historic jail, the property reverts back to the commissioners. The house is also is being sold as is, however, none of the conditions set for ownership of the historic jail apply to the property at 22 Court St. According to the National Archives Catalog, the jail and sheriff’s residence was placed on the National Register of Historic Places on June 12, 1990. The building was constructed in 1878 at a cost of $25,845. The first jail was a 12-by-24 log cabin built in 1814, and a second jail was constructed in 1850. The historic jail now up for sale was the third jail constructed for the county. Currently, the building houses the law library and the office of the Ohio Fifth District Court of Appeals. Both will move to the historic courthouse once it has been renovated. For more information on the bidding process, contact the Delaware County Facilities Management Office at 740-833-2280 or by email jmelvin@co.delaware.oh.us. Paperwork for placing bids can be obtained from the Delaware County Board of Commissioners’ offices located at 101 N. Sandusky St., Delaware, during normal business hours or online at www.co.delaware.oh.us under public notices and bids. This entry was tagged D. Anthony Botkin, Delaware County Commissioners, Historic Jail, invitation to bid, Jon Melvin. Bookmark the permalink.